The world's pickiest eater actually lives in my house! No joke, as a person who really hasn't met many food items I won't eat, I'm really not sure how that happened! So when I make something that the world's pickiest eater actually eats and then says ‘yummmm!' while eating it, I think I must have done something pretty good. And when this ‘yummmm' food is so very easy to make…I've flat out scored. 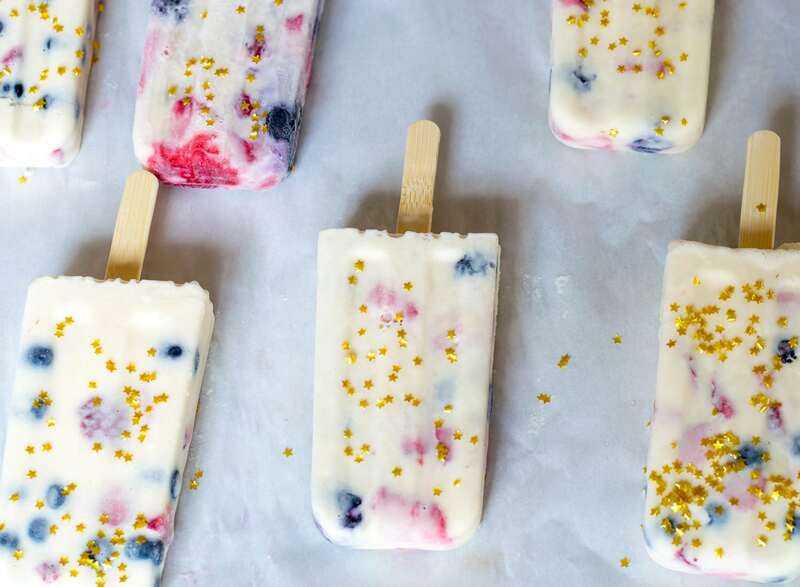 These Red, White and Blue Ice Cream Popsicles checked both boxes. And if you're thinking…'well, of course, he ate it…it's a sweet dessert.' Oh no my friend, his list of food he doesn't like changes regularly…so while I thought he liked chocolate and made a batch of brownies…he didn't touch those brownies. And truthfully, while he loves these ice cream popsicles this week, it's entirely possible that next week vanilla will be on his ‘no thanks' list, so you never know. Softened vanilla ice cream, chopped fresh strawberries, and fresh blueberries not only are a perfect summer taste combination for your tongue but they just so happen to be perfectly patriotic for our upcoming Fourth of July Festivities, especially when sprinkled with edible gold stars! Are you kidding me…red, white and blue AND gold stars. Mic drop. I used store-bought Breyer's Homemade Vanilla Ice Cream for this tasty treat and will surely use it again; but if you are a purist and an ice cream maker to boot…then go homemade my friend! These stainless steel molds are my favorite for popsicles; they release easily, don't retain flavors or stain like plastics sometimes do, you can make just one popsicle at a time if you wish, they are dishwasher safe and they will last forever. Yesterday my two men went on their annual fireworks shopping spree, so all the pieces of our family festivities are falling in place…we know what we'll have for dessert and we know what entertainment we'll enjoy while we're enjoying said dessert. Our neighborhood actually throws a great fireworks show…on the 3rd of July. Which actually works out great…we get our big booms in on the 3rd and then can stay right in our back yard to watch the pyrotechnics that Rob and Terry orchestrate on the 4th. You can make these ahead of time and remove them from the molds and keep them in the freezer. That way, if you need more than the 6 that one mold set makes you could make 6, freeze them and continue to reuse the mold until you have enough…while surely not time-consuming you will need to allocate the 5 hours freeze time for each batch. If you go this route, put your frozen popsicles on a sheet of parchment paper on a cookie sheet so that they don't stick. Gently mix the blueberries and strawberries with the softened ice cream so that you don't bust your berries. Pack the softened ice cream into your popsicle molds, gently. Tapping the molds on your counter to make sure it settles all the way to the bottom will help ensure that you don't have any holes in your ice cream popsicle. When you are ready to serve, run the mold under cool water for about 2-3 seconds (may take longer for plastic molds). If you are going to put them in plastic bags, let them freeze again before you put them in the bags. Tucking your frozen popsicles in 4 X 6 treat bags makes them easily portable. Of course, you'll want to tie them off with some cute ribbon because cute ribbon just makes everything that much more festive. N&N TIP: Use dry ice to keep your ice and your popsicles from melting quickly. A lump of dry ice at the bottom of your bowl, cover by regular ice will help slow the melting process. Have you started planning your Fourth of July festivities? If you think you might want to throw these Red, White and Blue Ice Cream Popsicles into the mix, make sure you pin it so you can find it when you need it. These are so pretty! They would be perfect to serve at the lake. I am going to get those stainless molds. Absolutely perfect for a lakeside celebration this Fourth! Let me know if you make them. These sound delicious and are perfect for a patriotic celebration. The edible gold stars are such a nice extra touch! I had to smile while reading your comments about your picky eater as I have one like that in my house as well….what they liked last week or last month may not be something they like today. The ingredients of these Popsicles seem to all be on the “acceptable list” at the moment so I’ll be trying this out soon. I just might have to purchase one of those Popsicle molds too. I love the fact that the stainless steel won’t stain or hold odors like plastic, and dishwasher safe is a nice bonus. Thanks for sharing such an easy, festive and fun dessert. Hey Dorene, good to know I’m not alone…but man does it stick in my craw. Right now all he eats is Ramen noodles, which I refuse to buy, so he uses his hard earned money to buy them in boxes from Amazon! UGH! I just have to close my eyes and pretend i don’t see. Hope you enjoy the popsicles…they were a hit. Oh Lynn, these look so super yummy! I will have to make them! And I love the stainless molds too. I have the plastic ones and I will have the stainless. I love pops and this recipe is super! Oh good Carolann! They were so easy…and so yummy. Oh my gosh!!! These look SO delicious!!! I LOVE the sweet little stars!! I will have to try these for sure when Summer hits here in Australia! YUMMO! Oh Good…at least we share the same colors…right? This Saturday we’re actually invited to a 4th of July party here on the American Naval Base, so it’ll be a fun night! Your beautiful and [I’m sure] very tasty popsicles would be a great addition! Even as an everyday snack! Enjoy your holiday Lynn, unfortunately I couldn’t play the video, not sure if it’s because of my location… Have a fun week! These are not only pretty to look at but also must be very delicious! Happy Fourth my dear friend. I have so many fond memories of watching the fireworks. Hi Mary…thanks for stopping by. These popsicles are really just perfect for summer…cold and refreshing with those yummy summer fruits.